The Showtec LED Par 56 Short is a Par 56 with RGB colourmixing. Due to the use of LED's, the lifetime is extremely long and the power consumption is very low. The Showtec LED Par 56 contains 153 LED's (51 x red, 51 x green and 51 x blue). It can be controlled by 6 DMX channels (RGB and pre-programmed chases and colours) automatically by its built-in processor or music-controlled by its internal microphone. The Showtec LED Par 56 Short is a Par 56 with RGB colourmixing. Due to the use of LED's, the lifetime is extremely long and the power consumption is very low. 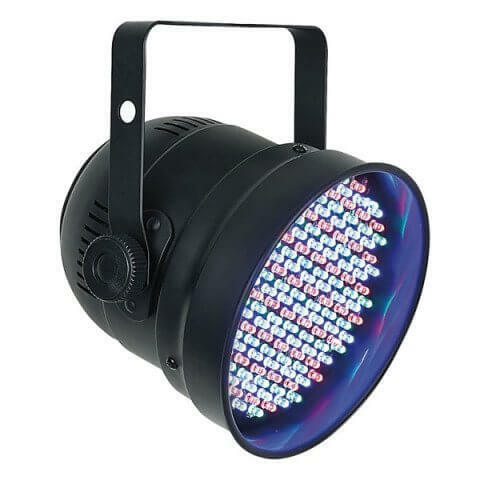 The Showtec LED Par 56 contains 153 LED's (51 x red, 51 x green and 51 x blue). It can be controlled by 6 DMX channels (RGB and pre-programmed chases and colours) automatically by its built-in processor or music-controlled by its internal microphone. Duty cycle: Colormixing 8 hours / Full on: 2 hours. Not abled for continious use!